Vermont Garden Journal: Green Shakes! I’m Charlie Nardozzi and this is the Vermont Garden Journal. Here’s how not to impress someone on your first date. When Wendy and I were first going out, I offered to make her a green shake from some extra veggies she had. 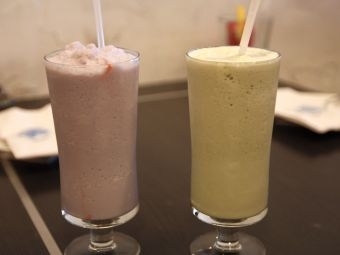 I had been experimenting with making green shakes back then, but hadn’t gotten the technique down. Well, I put in way too much kale, not enough fruit, and we ended up having green sludge, that we ate with a spoon. But don’t let my early failures stop you from making and drinking green shakes. What are green shakes? They’re blended up leafy greens mixed with fruit. You can use almost any green you normally would find on a salad such as spinach, lettuce, arugula, Swiss chard, and even kale. By blending them with fruit, such as bananas and oranges, you make a sweet tasting, healthful drink. My usual blend is 60 percent fruit to 40 percent greens with enough water to make it all mix. But why drink greens, when you can just eat them? Well, in our fast paced world, we often don’t have enough time to make ourselves something healthful to eat. A green shake is a quick way to give your body the vitamins, minerals, amino acids, and nutrition it needs. Plus, when you rip up greens in a blender, you’re breaking down the cell walls, making the nutrients more readily available to your body. Once you get hooked on the basic green shake concept, you can get creative adding coconut water, flax seeds, parsley and cacao powder to your drinks. So, take a look at your fall garden and start harvesting extra greens to experiment with green shakes. You’re body will feel better for it. Oh, and by the way, Wendy forgave me for my first green shake disaster and married me anyway. Now for this week’s tip, it’s time to order spring flowering bulbs such as tulips, daffodils, and crocus. Order on-line or buy bulks locally while supplies and selection is good. You’ll be planting in a few weeks. Next week on the Vermont Garden Journal, I’ll be talking about cover crops. For now, I’ll be seeing you in the garden!